The Naveta des Tudons is to be found a few kilometres from Ciutadella, on the right hand side of the main road to Mahon. 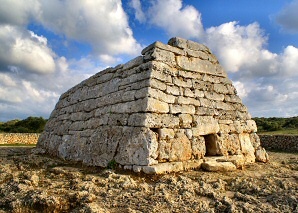 It is a very well preserved megalithic construction, considered to be one of the most emblematic archeological remains on Menorca, and possible the best known one in the whole of the Balearics. The construction is 3.000 years old and was used as a collective funeral monument. Inside the remains of human bodies have been found, accompanied by personal objects such as bronze jewelry and other ornaments, plus the odd weapon and ceramic bowls that would have contained offerings. The construction, comprised of perfectly connected stones without mortar, looks like an inverted vessel and therefore this kind of prehistoric building is known as a "naveta" (vessel). The floor is formed like a long horse-shoe 13.6 m long by 6.4 m wide. The facade, west facing, is almost flat and has a small access aperture to the interior. The enclosed area is divided in two levels via giant horizontal slabs that are very well formed, the same as those that make the covering. The Naveta des Tudons is part of a tragic legend about giants who were disputing the love of a young girl. The giants agreed that one would build the "naveta" and the other would dig a water well and the first to finish would marry the girl. The giant building the well found water first, but the other one, mad with jealousy, killed him by throwing the last stone he had to fit. Today that stone is still missing from the facade of the "naveta".